Elliott Montroll was Professor at the Institute of Physical Science and Technology at the University of Maryland (1981-1983). Other institutional affiliations included University of Rochester, International Business Machines (IBM), the United States Navy's Office of Naval Research, and the University of Pittsburgh. His research interests included lattice dynamics, the theory of unimolecular relaxation, and the theory and application of random walks. May 4, 1916Birth, Pittsburgh (Pa.). 1937Obtained BS in Chemistry, University of Pittsburgh, Pittsburgh (Pa.). 1940Obtained PhD in Mathematics, University of Pittsburgh, Pittsburgh (Pa.). 1940 – 1941Sterling Research Fellow, Yale University. 1941 – 1942Research Associate, Cornell University. 1942 – 1943Instructor in Physics, Princeton University. 1943 – 1945Head, Mathematics Research Group, Kellex Corporation. 1944 – 1946Adjunct Professor of Chemistry, Polytechnical Institute of Brooklyn. 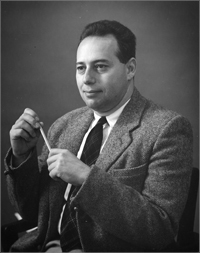 1946 – 1948Assistant Professor to Associate Professor of Physics and Mathematics, University of Pittsburgh, Pittsburgh (Pa.). 1948 – 1950Head, Physics Bureau, Office of Naval Research, United States Navy. 1950Visiting Professor, Courant Institute, New York University. 1951 – 1961Research Professor, Institute of Fluid Dynamics and Applied Mathematics, University of Maryland, College Park (Md.). 1952 – 1954Director, Physical Sciences Division, Office of Naval Research, United States Navy. 1958 – 1959Guggenheim Memorial Fellow, University of Brussels. 1959 – 1970Editor, Journal of Mathematical Physics. 1961Lorentz Professor, University of Leiden. 1961 – 1963Director-General of Science, International Business Machines (IBM) Technology Center. 1963 – 1966Vice President, Institute for Defense Analyses. 1966 – 1981Einstein Professor of Physics and Chemistry and Director, Institute of Fundamental Studies, University of Rochester, Rochester (N.Y.). 1981 – 1983Professor, Institute of Physical Science and Technology, University of Maryland, College Park (Md.). December 3, 1983Death, Chevy Chase (Md.). Post-doctoral advisor at Cornell University in Phase Transitions. Post-doctoral advisor at at Columbia University. Advised by Montroll at University of Maryland. Post-doctoral advisor at Yale University. Head, Physics Bureau, and Director, Physical Sciences Division. Obtained PhD (1940). Assistant Professor to Associate Professor of Mathematics. Einstein Professor of Physics and Director, Institute of Fundamental Studies. Editor, Journal of Mathematical Physics. E. W. Montroll papers, 1936-1982 (bulk 1972-1979). Notes of lectures on application of probability theory to physical problems, by Elliott W. Montroll, 1952 July. Physics lecture series at Wayne State University [videorecording] / by Elliott Montroll ; 1974. Oral history interview with Louis Witten, 2011 March 17. Elliott Montrol Physics Today obituary. Random walks and their applications in the physical and biological sciences (NBS/La Jolla Institute-1982) / edited by Michael F. Shlesinger and Bruce J. West.